Rise up the Brawl Stars ranks by joining Clubs Team up with friends and like-minded brawlers and battle other Clubs in friendly matches or win trophies in Ranked mode. 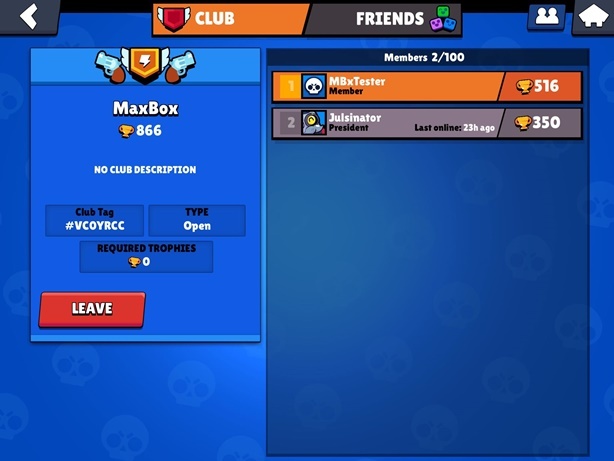 Clubs are Brawl Stars’ version of a team or guild. Players join Clubs in order to have a team with their friends or other more skilled players. When in a Club, players can create a game room where they can invite other players to a friendly match or grind trophies and tokens in ranked matches. Players in Clubs can also chat with their fellow Club members. Any player can join a Club, but Club Leaders can set a trophy requirement in order to screen Club member aspirants. They can also set the Club type to Open, Invite Only, or Closed. Clubs can have up to 100 members. A Club’s Trophy score is calculated using the individual Trophy counts of the Clubs’s members. what are the ranks in clubs- like in clash Royale it’s members, elders, coleaders and leaders.